It doesn’t get much better than living the life of an NFL player. Catered meals, private travel, throngs of fans, social media prominence; it’s the good life. You even get to play as yourself on the Madden video game, which just adds to the fact that millions are already watching you on TV every week. What more could a guy ask for? Maybe this is why I became a church planter. It provided a life comparable to playing in the league. Basically the same thing, right? Wrong. 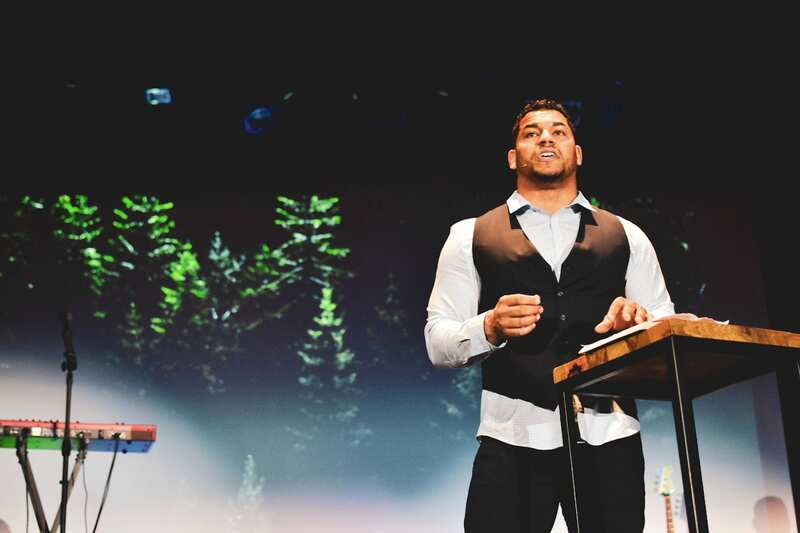 Church planting and playing in the NFL are on opposite ends of the spectrum. When I entered the NFL, I already knew I wanted to plant a church one day. I met Jesus in college while reading the King James Version of the Bible, which I’d been given by a stranger. About eight months later, I sensed God perhaps calling me to ministry. I wasn’t ready to plant a church at 19 years old (despite what I thought at the time), so the best course of action was to continue through college and see where football would take me. In college, I was honored to be selected first team all-conference, as well as team MVP. The hype began to buzz in the coaching and scouting world. Not many players come out of the University of Idaho, so when one does, the entire state tends to get excited. Despite all the personal attention I received, our team was horrendous. We finished 2–10 my senior year. To add insult to injury, our season ended in a huge loss, and I blew out my knee, which significantly hurt my chances of being drafted. I didn’t expect God to use one of the most disappointing seasons of my life to prepare me to plant a church 10 years later. I didn’t expect God to use one of the most disappointing seasons of my life to prepare me to plant a church 10 years later. With nothing to do but sit on the couch and read while I recovered, I devoured the Scriptures. I read the whole Bible on that couch, and my sense of calling began to solidify. I was gripped by the glory and majesty of God. More than ever I knew that, at some point, I wanted to plant a church. Despite my injury, I was drafted by the Washington Redskins in the seventh round of the 2009 draft. It was a dream come true. I’d spent my entire life working for that moment. It was even a promise I made to my mother on her death bed. Yet somehow, as I flew to D.C. for training camp, I felt utter discontentment. My time on the couch the previous 10 months had done something to me. Feasting on God’s Word had shaped me. I felt completely torn. It sounds crazy that someone could get to the NFL and not be happy, but there I was. On top of all this, I needed a few unexpected surgeries, which only compounded the uncertainty about my future in the NFL. One morning, I went for a walk to pray, asking God to give me insight about what to do. I was contemplating quitting football. But as I prayed, I realized I needed to embrace where God had placed me. I also realized that my discontentment was not neutral; it was offensive to God. Discontentment in our circumstances is discontentment with God himself. So I settled in and gave myself to glorifying him in the league. My vocation as an NFL player was valuable to God and, if nothing else, was a platform to share the gospel. My football career of five years ended after I had back surgery while with the Cleveland Browns. Most players experience some sort of existential crisis once football is over. For many, football is all they’ve ever known. But I knew exactly what I desired to do. In each city my wife and I moved to while I was in the league, we joined a church plant. When football finished, we kept doing the same. After serving in ministry in the Seattle area for nearly two years, we decided to move to Salt Lake City. We met a couple who was there to plant a church, so we jumped in. We loved Salt Lake, and our family became comfortable there. I was working for the Fellowship of Christian Athletes and helping to plant a church. We owned a nice home, and my kids liked the city. The dream of planting a church slipped to the back burner; we assumed we’d plant one day, but not for a while. But God determines where he places his people, and when (Acts 17:26). After three years in Salt Lake, the doors began to fly open to plant a church in my hometown of San Francisco. I met a guy at the Acts 29 US West conference who lived in the city and helped me think through logistics. Everyone was supportive—including pastors, family, and mentors. The only thing stopping us was our comfort. We weren’t expecting to experience such comfort and stability in Utah. It was a stark contrast to life in the NFL, which was marked by uncertainty and instability; I could be fired at any moment, and we’d have to up and move to a new city or state. It was stressful. In Salt Lake—for the first time in our marriage—my family was able to take a deep breath and put down roots. So even though the opportunity to plant a church in San Francisco seemed to fall into our lap, it wasn’t an easy decision. San Francisco is the most expensive city in America. Is God really asking us to sell most of what we have for something that might not work? We longed for clarity. Would this work? Would it be worth it? God doesn’t promise perfect clarity. He promises to be faithful. But God doesn’t promise perfect clarity. He promises to be faithful. He was simply asking us, “Come and see” (John 1:39, 46). Despite our lack of perfect clarity, the call was so palpable that we felt we’d be telling God “no” if we didn’t go. So we went. So we moved back to San Francisco in March 2017 and launched a Bible study in our home in January 2018. Since then, we’ve had a front row seat to God’s faithfulness. We officially started Bay City Church in September 2018. As a young church family, we’re learning that God is often going to ask us to jump before he hands us the parachute. He wants us to trust him. And because of God’s perfect track record of showing up when I need him, I’m learning to trust him in my weakness as I lean on his strength and labor for his fame.